POP MOVIES: 'Spider-Man: Into The Spider-Verse' Shows Off A New Story, New Animation, And A New Afro-Latino Spiderman, And - POP GOES THE WEEK!! Hollywood loves them some Spiderman. So much so that there has been six Spiderman films since 2002. Six! Meanwhile She-Hulk is over in the corner happy to settle for a cameo at this point. None the less, the web-slinger is a fan favorite, and for good reason. Who doesn’t love an underdog story? Well the new film, Spiderman: Into The Spider-Verse, introduces a new story involving the legacy of Spiderman and, more importantly, introduces a new Spiderman all together. Miles Morales, an Afro-Latino teenager from Brooklyn, is the latest hero to don the arachnid mantle. The animated film takes place in a different universe from the Spiderman we have seen before, so this time around Peter Parker (OG Spiderman) is taking on the role of mentor. The film aims to show the limitless possibilities that occur in a world where more than one hero can wear the mask. In the trailer for the film, we see Morales protect the streets of Brooklyn, while handling the pressures of teenage life. Towards the end of the trailer, fans were pleasantly surprised to see Gwen Stacy make an appearance as Spider-Gwen. Plot twist! The standout of the trailer is the animation. While Marvel has taken to live action movies with many of it’s franchises, this film seems to nod at the brand’s origins. The animation of this film is unlike any other and looks as if the comic book has come to life. The heavy, black lines outlining the characters, the paper-like movements, and even the dialogue boxes incorporated into the film all help enhance the idea of watching a moving comic book. The visuals alone make this film worth watching! The cast includes some heavy hitters with Shameik Moore, Hailee Seinfeld, Liev Schreiber, and Lily Tomlin headlining the film. We can expect to see Spiderman: Into The Spider-Verse hit theaters this Christmas. Until then, check out the trailer below! OMG: ‘Legally Blonde 3’ Is Officially Happening! TRAILER ALERT: Check Out the New Four-Minute AMAZING SPIDER-MAN Trailer! TRAILER ALERT: New AMAZING SPIDER-MAN Trailer Is The Best Yet! Over in Bensheim, Germany a rotund rodent got herself into a jam when she tried to squeeze through a hole of a manhole cover only to get stuck…and honestly, I can relate. When I was 8 years old I tried to squeeze my thunder-thighs-in-training into a children’s swing and it took my dad and three other grown men to get me out. I am the German fat-rat! Alls well that ends well! Hopefully no authorites will be needed to help me shimmy out of these skinny jeans I thought looked cute this morning…in the meantime, check out the entire rescue below! The dancer may be tiny but the talent on stage was massive! 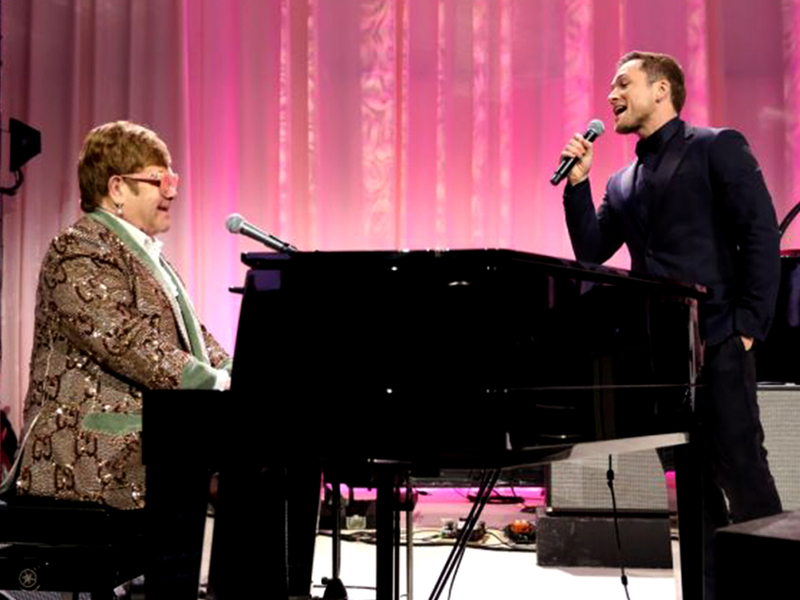 Taron Egerton and Elton John gave a fantastic performance of “Tiny Dancer” last night at the 27th Annual Elton John AIDS Foundation Academy Awards Viewing Party. If you’ve been looking for a reason to toss on your bedazzled cape and brightly colored sunglasses then boy do I have good news for you. An “epic musical fantasy” about Elton John’s life, entitled Rocketman, is expected to hit theaters in May 2019. Taron Egerton, from Robin Hood fame, plays the musical legend and judging by his performance last night, we are all in for a treat. The audience of the charity event felt like a candle in the wind when Taron suggested an off-the-cuff performance of “Tiny Dancer.” There isn’t even a pun creative enough to embody what the audience must have felt when Elton John himself volunteered to accompany Taron on the piano! In addition to a truly moving performance, the 27th Annual Elton John AIDS Foundation Academy Awards Viewing Party raised more than $6.3 million for an effort to end AIDS. Click below to take a look at the magical performance from last night! In this viral video posted to Twitter, an adorable pup channels his inner Cujo anytime his owner gets close to the Barney the Dinosaur stuffed animal. While the frenzied attacks are comical in themselves, this video should definitely be played with the sound up. While we never see more than the dog owner’s hand, we hear his high pitched screams of terror every time the dog take a lunge. 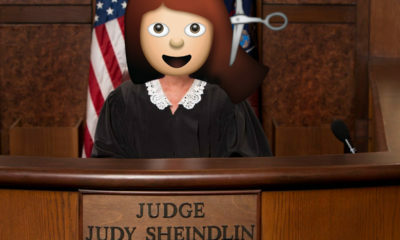 Click below to laugh along!